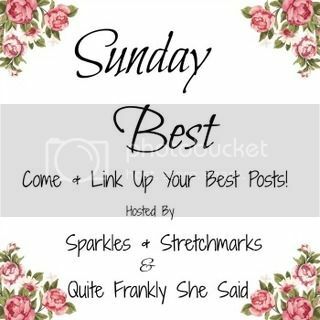 #SundayBest - A New Linky To Showcase Your Best Posts! Lately I have really been enjoying joining with some linkys and have discovered a real love for them. A couple of years ago, I ran my own linky for a few months but - for various reasons - I didn't stick with it. But now...I've teamed up with the very lovely Sian from Quite Frankly She Said to host this weekly linky once again and here's hoping it will be bigger and better than before! We want to keep things nice and simple, si there are very few rules and if we all play nicely then everybody benefits!